Published on September 10, 2015 in Elections, General T&T, PNM and Politics. 19 Comments Tags: Keith Rowley, Politics, T&T Govt. 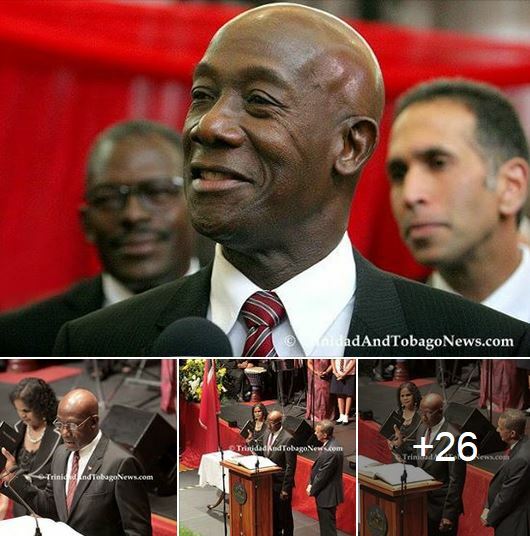 September 09, 2015 swearing-in ceremony of elected Prime Minister Dr Keith Christopher Rowley, Attorney General Faris Al Rawi and National Security Minister Retired Major General Edmund Dillon at Queen’s Hall, St Ann’s. We will support our PM and give him due respect in spite of our stinging criticisms during the campaign. We are vigilant. We will jump on any screw-ups in the future administration of the country. Rowley’s graciousness is no accident. He is fully aware that the PNM received 378,444 votes, while the PP received 334,057 votes. In addition the votes were almost completely divided racially, making T&T a very racially sensitive environment. In some northern constituencies his party received as much as 80% of the votes cast. The “Take back our country” campaign was successful. The big question is, in the perception of PNMites, who did they take back the country from? Okay, I will play devil’s advocate for a moment; if the vote was primarily along racial lines, what accounted to this shift back to electoral status quo? I imagine you would cite race baiting and propaganda on PNM platforms as a possible explanation. However, what about the actual conduct of the government while in power? Perhaps the PNM stoked fears of racial bias in hiring practices on state boards and appealed to the basest instincts of many voters. There was the widely held perception among the Afro-Trinidadians and Tobagonians that the People’s Partnership was not an appropriate title for a ruling party that exercised power in a manner that suggested anything but partnership among the people. Make of this post what you will. TMAN you are so freaking deceitful it is nauseating. In your first comment on the results you were claiming that the PNM lost the popular vote and suggesting that there will be changes. Now you are attributing some silly notion to Rowley’s graciousness associated with the vote differences. I am not qualified to say who Rowley was “channeling”. I am simply stating a fact, after examining the vote count in all 41 constituencies. The logical conclusion is that the votes were racially divided. I have not examined reasons for such a phenomenon. I am simply stating that any leader has to be sensitive to this almost equal vote distribution by race and territory. While we debate , it seems that Rowley is responding to this challenge that he seems to be aware of by balancing his ministerial appointments to appeal to the nation, as we speak. An intelligent statement but if you are listening to Dr. Rowley you would be aware that he has responded to the Indian concerns. Here we have a half Indian, Al Rawi occupying the highest law and constitutional position of AG. The Minister of Agriculture, the Minister of Rural Affairs and Permanent Secretary in the Ministry of Agriculture and the Ministry of Health. These are substantive ministries that affect the health, food production and economic life of the population. It means that those who are sensitive to racial identity will find that the PNM is well on its way to treating people with equity and respect. I fell sorry for those who equate equity with quantity. The people who are in those ministries are all highly qualified and not put up there for “window dressing”. This new administration has moved away from the puerile politics of the past and we should all hope that it remains so. Sorry I meant Parliamentary Secretary and NOT Permanent Secretary. The new PM has responded symbolically to the concerns of those who did not support him. His line up of ministers is a reflection of the multicultural nature of our society. The last time this occurred under the PNM was during Eric Williams early years. It is a good sign for the future of the country. He has also invited the Opposition to be part of the governing of T&T. So far the new PM has said all the right things and made all the right moves. Let’s hope the Opposition takes up the challenge by doing the opposite of what he did as Leader of the Opposition. The PNM took the Country back from the plebeians, sycophants and other advisory and propaganda associates of the PP who were determined to drain the till in order to take the nation down to bare bones, before rebuilding it in along lines they envisioned would make clear the separation of caste and power. If you were listening to the campaign speeches you would not be asking that question. They were very precise. They named names, cited issues. They were against a corrupt political class that spent five years pointing back at the PNM tenure while disorder and chaos became the norm. Fate listened to the predictions of you and Mamoo, laughed in your face and shouted HAH!!! As Kamla found out, political power is fleeting. What really matters in the advancement of any society or group is economic,social, educational and financial power derived from industry, hard work and dedication. Let’s hope the country moves forward. What Kamla found out, is that as time elapses people become wise to things that they were denying. That the more you continue testing their tolerance, testing their intelligence, they more you awaken a consciousness and fortitude within them that has withstood the test of time. That has withstood centuries of experiences that would have probably destroyed others. That is what she found. What is instructive in this Post Mortem, is the focus on Rowley’s reaction and the ignoring of the crass and uncouth behavior and attitude of the former Prime Minister exhibited in her acceptance of the election results. Like I read in an article in one of the newspapers, sometimes it is not how a leader behaves after being victorious that brings out the best and worse in them, that displays their leadership qualities or lack thereof. Sometimes it is how they behave after defeat that does that. And what we have seen from this former Prime Minister following her defeat vindicates the opinions and perspective of every one of us who have been critical of her leadership over the past five years. Her boorish and childish behavior and attitude will remain as an infamous epitaph on a political career that was lacking in the most important personal characteristic among those who choose it. That is, leadership qualities. Whew! What a week it has been. An election charge with promises and character assassinations. TNT elections are always filled with drama and this one did not fail to deliver. More so than most elections that have seen. At the inception of the campaign, the PNM almost took a back seat as Jack Warner treated the nation to the delight of the PNM with a nightly barrage of allegations. It was filled with juicy, lurid and hate filled descriptive that must have made even Satan proud. How that man sleeps at night is beyond me, someone once said he don’t sleep. The UNC opened its choir book and started to sing the praise of Kamla as thousands gather to listen with rapt attention. The PNM understood the fears of their constituents and send out the red army 3 months in advance to stir those fears up. Chief to head the list of emergent leaders was a softer more prepared Shamfra Cudjoe, she methodically wadded into the Kamla image and became an over night sensation. With propaganda precision she destroy Kamla’s image in the mind of the PNM electorate. They had new ammunition to go out and win converts to the balisier cause. This they did relentlessly until UNC supporters wondered aloud as to where was their party and candidates. Behind the scenes there was a lot of negotiations going on in the Partnership camp. With 3 weeks to go the yellow force was unleashed. It was a comedy of errors, people were not sure of when and where meetings were being held, a week before elections when people attention was at the highest, there were no visuals on television, Rowley was the only one on TV. People tuned in to him and many undecided bought into his message. The most crucial part of an election is the last 2 weeks. PP supporters were complaining, the PNM was in my area 4 times but I did not see my representative yet. What the PP fail to understand is that there are the “diehards” on both sides and then there is the undecided. The “no Rowley” campaign was a bust at the beginning the feed back was not positive but they still continued with it. The media,newspapers, radio, TV, trade unions favored the PNM. As such a battery of anti PP writers were employed in one newspaper alone some 6 of them. The other media outlets were headlining all that Warner was selling. There were several radio stations bashing the PP daily. This attack bore fruit in the East West Corridor, where former PNM supporters returned home. The PP did a lot of work in TNT in fact no other party ever recorded such a great history of achievements in such a short time. The PNM sold their bottle of snake oil to the public by speaking about corruption, favoritism, racism etc that appeal to the fears of the supporters and undecided. The PNM knew what to sell and understood its constituencies. Congratulations to Dr. Rowley, I wish him the best. I must say he has dispel the loud, rough, testosterone charged voice for a more softer, kinder, gentler persona. How long will he manage this change! It remains to be seen. Mamoo, I have often pledged not to respond to your diatribe because I view them as subservient to your beliefs and religious traits. During the course of this election campaign I listened to most (if not all) of the commercials put out by the parties involved and I must say that Kamla’s was the worst. Let me explain why. The idea of commercials are not for your followers. It is meant to convey a sense of belonging to captivate a non believer’s attention. When that attention is captivated, then you use persuasion to include that entrant into your camp. The UNC’s use of “KAMLA 2015” might be eye-catching but certainly not pursuasive because it said nothing. “Your Government is Working for You” – what else is a government supposed to do? “Kamla has a Plan” – what utter nonsense! (to the cities), introduction of the caste system, lost of hope and fairness amongst other negatives. If you want to be honest, this is what those who were against Kamla saw. True to form her support amongst those of like thinking were upheld but the cross-overs from 2010 all abandoned her this time. There was nothing about her messages to encourage them to stay and allow her to be the leader she was in 2010. You may forecast the demise of Rowley all you want but for now this is what the people saw and this is what they ran away from. Dr. Rowley will be given his chance to show what kind of leader he wants to be and we should allow him that opportunity. In the meantime, Kamla should examine her performance and determine if what she has shown and displayed is what she wants for Trinidad and Tobago going forward. If the answer is in the affirmative, then she should be warned before hand that the people WILL reject her. People will not be fooled by the woman power thing they have definitely learnt what to expect when leaders are untruthful. Yes the campaign was sabotage from inside Kian. The adds annoyed people, in fact I was annoyed at the repeating of one add in particular almost every 2 minutes on television. But Trinis are better for all of it. The PNM cannot sit on their lazy arses for the next 5 years. Nor can they mismanage this is an electronic age. In 5 years you all bruk up de Country, ran it like a model of the deeply stratified society of 18th century India, acted like you were the Brahmins, the privileged, entitled to be more equal than those you categorized as inferior, and like the Hyskos when they were kicked out of Northern Egypt, on your way out you proceed to fabricate a record and history that represent a confused synthesis of myths and idiotic conceived notions. You never expected the PNM people to fight back. You fooled many of them into believing you were not, what those who had studied you intensely for decades, knew you were. They had observed the signs, could juxtaposition it with historical precedence in Europe, in Africa, in the US back in the 60s, 50s, and going backward. They had observed how closely your narratives mimicked that of Governor Wallace of Alabama back in the 60s. They observed the trend creeping through the Caribbean going back to 1992, when an alliance across the Atlantic was formed, with the sole purpose of using the resources of two of the largest states in the Caribbean Commonwealth region to create an apartheid like system where the majority would be relegated to second and third class citizenship, while you masturbated your egocentric ethnic sense of Brahminian superiority. But dem PNM people fought back. Dem PNM women fought back. They drew the attention of the people to what you were engaged in. The people understood the seriousness of the occasion, the threat to the very essence of fairness and equality in T&T, and your construction of an Orwellian Animal Farm like preserve where you assumed the human roles of his porcine characters. They saw how you skillfully and cunningly attempted to scare them into accepting the crap that you were the brain power in T&T, and that you should be allowed to enjoy most of the resources, benefits and privileges available because you were working to ensure that the PNM do not come back. But this backfired, because you riled them up to such an extent that the cry became, “we Red and we Ready, and we PNM people will fight back”. So do your worse you curs, and the PNM will do its best for all of the people in T&T. The PNM comes to the fore with a leadership and governing assembly that is detached from any religious or cultural crap that people are superior or inferior because of how they look. The PNM comes to the fore of leadership in T&T channeling their character Mandelas and Martin Luther King, and will produce a style and manner of Governance that leaves no doubt that its predecessor was just a Caribbean clone of the apartheid South African National Party. In all of this triumphalism, black back slapping and celebratory delight at your victory in T&T, you PNM loyalists are forgetting one plain truth: Half the population did not support Rowley. You are also forgetting that the constituencies in Trinidad have long been gerrymandered by former PNM governments in concert with the EBC to give the PNM an advantage. But a victory is a victory….fully accepted with best wishes for the new government. Will the President ever get anything right?